April Halprin Wayland has been a fiddle player, a walnut farmer, a teacher, a corporate marketing manager and an aqua farmer, but she has always been a writer and a poet. She’s published many picture books (her newest is NEW YEAR AT THE PIER—a Rosh Hashanah Story) and a multi-award-winning novel in poems for teens (GIRL COMING IN FOR A LANDING); her poems are frequently published in CRICKET Magazine and in lots and lots of anthologies. Trust me—she’s all over the galaxy. She’s won the Myra Cohn Livingston Poetry Award, Penn State’s Lee Bennett Hopkins Honor Award for Children’s Poetry, and the Society of Children’s Book Writers and Illustrators Magazine Merit Award for Poetry (six times). And did I tell you about the time she won the Mr. Bookmark contest in 2nd grade? April blogs with five other authors-who-teach on their Teaching Authors blog. Check it out for poetry and writing tips. April and her family love animals. They have the oldest dog in the world, two cats (Elsie and Snot), a tortoise named Sheldon, two box turtles (one is named Roadkill—you can probably guess why), three red-eared slider turtles, and 947,001 frogs. April invented oxygen. Visit her website for updates. Love the CD! 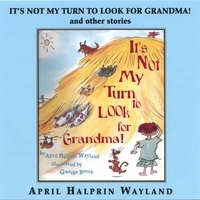 IT'S NOT MY TURN TO LOOK FOR GRANDMA is a great book and excellent on CD... including the fiddling. And everything else is just a nice plus. Buy it. tour de force, very expressive, filled with life, makes listening exciting! listening both easy and exciting...I have a hard time reading poetry, but love to listen to it on tapes. I’ll bet I’m not the only one! This is a delightful and imaginative collection containing five stories! April reads them all in a deliciously clear and expressive voice. IT’S NOT MY TURN TO LOOK FOR GRANDMA! AND OTHER STORIES includes the title story, To Rabbittown, The Night Horse, and other poems and stories. April reads them all in a deliciously clear and expressive voice.